Like the Men in Black film franchise, the steady release of video games across consoles and handhelds ceased after the release of Men in Black 2. Without a film or animated series in which to tie into, it seemed like there was little interest in keeping the brand alive in the video game space until a third movie rolled around, which is what happened in 2012. It’s arguable as to whether or not the public was clamouring for the return of the MIB film franchise after being away for a decade, but in the case of the video game side of things, no one will argue that we needed another game after Men in Black: Alien Escape. Men in Black: Alien Crisis is one of the laziest movie tie-in games ever produced that was destined for both the bargain bin and obscurity before the disc was even pressed. Unlike literally every other Men in Black video game produced, in Alien Crisis you play as neither Agent J nor Agent K (you do learn the lame excuse they’re not in the game, and it’s not because of the time travel shenanigans from the film). Instead you play as a brand new MIB recruit, Agent P, who starts off the game as an art thief named Peter Delacour. Having been double crossed by the employer who tasked him with stealing an Egyptian artifact with alien origins, Peter gets roped into working with the elusive MIB agency to prevent a war that could result in the destruction of the planet earth. If you want evidence that voice actor Troy Baker is in every game, Men in Black: Alien Crisis is proof as Baker voices Agent P. Having Baker on retention however doesn’t save a plot that you won’t really care about or remember by the time the game is over (I needed a bit of a refresher myself). Baker does his best to inject life into a character that we have very little time to get to know, or like, but even the best can only work with awkward repetitive one-liners and boiler-plate dialogue. That’s not just limited to Baker, but also Laura Bailey who plays his partner, Agent C, who also gets very little to work with either other than to be the straight woman, or this game’s equivalent to an Agent K.
For most movie tie-ins going all the way from the 8-bit era through to the days of the PS2, you could categorize most movie related games as generic action platformers. Being a product of the PS3/Xbox 360 generation however, Men In Black: Alien Crisis modeled itself after the most dominant genre at the time: 3rd person cover based shooters, however Alien Crisis has more in common with something like Time Crisis than a Gears of War. The game removes all forward movement away from the player, limiting you to simply moving left and right between cover points, shooting aliens until they’re all dead at such a time the game moves you forward to the next series of cover. If it sounds simplistic, it is, and even calling Crisis a cover-based shooter would be a stretch because most of the time you don’t even need to be in cover. Most of the time you can stay out of cover taking hits and collecting the bounty of health power items that keep popping up. This is indeed an Xbox 360 game that was released in 2012. The game tries to diversity itself by adding stealth sections as well as vehicle stages where you’re in a flying car, but Alien Crisis can’t even make the idea of piloting a flying car with an endless supply of bullets fun. Whether you’re sneaking around or in a vehicle, everything is still about shooting. 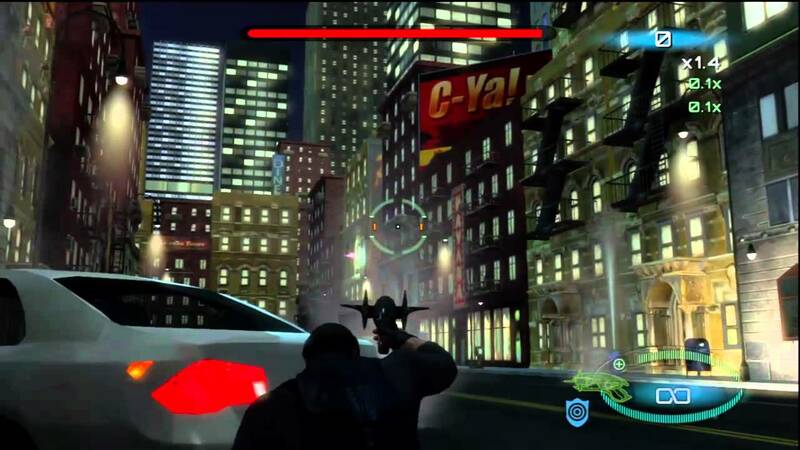 In the stealth portions you do actually have to use cover because getting seen means starting over from a checkpoint, but otherwise you’re just simply shooting easy to hit cameras and encasing guards in a bubble through your weapon’s secondary fire function. While piloting your flying car, you do have to be weary of obstacles and to fly through nulifier fields to erase people’s memories, but the act of doing so is incredibly simplistic. You don’t have to move your car with one stick and then aim with the other, instead you just simply need to point your reticule to where you want to shoot or avoid and your car goes there. There’s some attempt to add depth to the shooting mechanics by giving you a decent amount of weapons that can be upgraded as well as secondary fire functions that will allow you to generate a shield, slow time briefly or put civilians in a bubble to protect them from aliens. The weapons all have an MIB spin on them, however they fall into fairly basic shooter categories like sniper rifle, machine gun, shotgun, with the only standout being the Noisy Cricket that Will Smith used in the films. I upgraded nearly all the weapons in my play through, which only lasted about three hours or so, and stuck with two weapons: my starting one with a zoom function for enemies in the distance as well as the machine gun and was just fine. You can perform a scan to search for weak points in enemies and bosses, but about the only time you absolutely need this is when they introduce the mechanic and already tell you what you need to hit as well as in investigation stages. About the only time that you’re not shooting in Alien Crisis are in a few sequences, less than a handful, where the game suddenly turns into an awkward adventure game. Despite the sudden shift in gameplay though, these parts won’t exactly tax you mentally either. You’re locked in a room or area with a fixed camera perspective and you have to scan a small environment in search of one thing that will lead to a new converstation tree with an NPC that will allow you to progress. I wish these sections were longer, or even that someone like a Telltale would make a Men in Black game using their model. All of the MIB games are about shooting waves of aliens, yet in the movies there’s a fair amount of investigation that the agents do as well and Alien Crisis dips its toe into this, but just barely, and also not in a very interesting way. 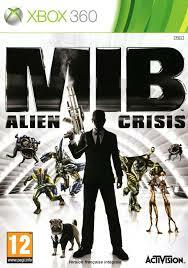 I reviewed Men in Black: Alien Crisis on the Xbox 360, but it’s also available on the PS3 and Wii. Without knowing the exact specifics, it’s easy to tell that Wii version was the lead SKU for development from the simplistic point-and-shoot gameplay to the graphics which are some of the worst ever on the Xbox 360. Everything from the character models to the environments are low-poly with ugly, muddy textures that were only slightly upscaled for the Xbox 360. This is the most egregious in the cut-scenes where you get to focus on characters up close and see just how badly they look and animate. When talking they all the movement and lip-synching of a PlayStation ONE game. Alien Crisis not only looks bad by launch Xbox 360 standards, but even early PS2 games had better visual fidelity. I managed to pick up Men in Black: Alien Crisis at an off brand department store chain in a bargain bin, probably next to Activision’s Battleship game which was also released in the same month as this, for about $10 CAD. The fact that a publisher like Activision, even briefly, asked anyone full price for this game is downright insulting. About the only people to recommended this game to are people who are still easy achievement hunters who can score this game for cheap. Everyone else should stay away from this short, shallow and ugly obvious cash grab that more than likely cost Activision more money in the long run.